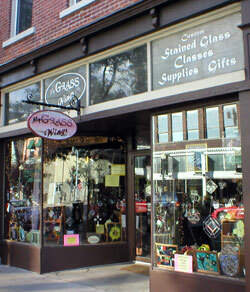 My Glass Wings is a stained glass studio and gift shop located in northeastern Michigan. Historic downtown Alpena's Johnrowe building, near the shores of Lake Huron, has been home to MGW since 2004. Creating one of a kind custom work, offering stained glass supplies and classes; gifts of glass; original crafted items by local artisans; and doing stained glass repairs, has kept MGW evolving and constantly changing.